Do you have a passion for fashion? If not, you will soon . . . at least, a passion for Fashion Furious! 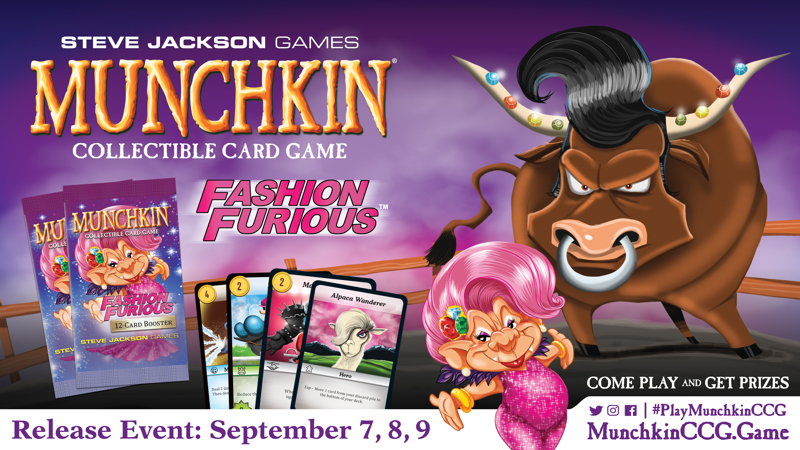 The second expansion for the Munchkin Collectible Card Game comes out in late August, and we've got a bunch of stores signed up for Fashion Furious Release Events on September 7, 8, and 9. Prizes will include alternate-art versions of Horsefly, Boom Boom, and Makeoverlord; the new neutral hero the Alpaca Wanderer; and two never-before-seen promos, the Malfunctional Machete and the Lame Duck. Stores across the U.S. and Canada will host these events. Find a store near you, call them for their specific event date and time, and mark your calendar. Some events may be drafts or constructed tournaments. Others may run learn-to-play or casual-play events. We are also running a social-media contest during these events: Post to social media with #PlayMunchkinCCG and a picture of your event on September 7, 8, or 9, and you're automatically entered to win an acrylic level dial.